Speakers : Oscar Di Montigny – Chief Innovation, Sustainability & Value Strategy Manager at Banca Mediolanum . Author of best seller Economy 0.0, Rand Hindi - Data scientist and CEO of Snips, Pierre Lebeau - Founder at Keecker, Marie-Hélène Tonnellier - Lawyer at Latournerie WolfromP - Moderator : Gilles Folin – Co-Founder of The Robot Of The Year, and partner at What’s Next Partners. Speakers : Oscar Di Montigny – Chief Innovation, Sustainability & Value Strategy Manager at Banca Mediolanum . Author of best seller Economy 0.0, Rand Hindi - Data scientist and CEO of Snips, Pierre Lebeau - Founder at Keecker. PANEL : LESS JOBS? NEW JOBS? BETTER FUTURE ? Speakers : François-Xavier Petit - Managing Director of Matrice, Christophe Montagnon - CTO at Randstad, Alexandre Pachulski - Founder at TalentSoft, Yann Gozlan – President at Creative Valley, Moderator : Christian Darvogne - KPMG Partner, Founder of Carewan by KPMG. Speakers : Moderator : Frédéric Vacher - Head of Innovation 3D EXPERIENCE Lab at Dassault Systèmes, Serge Tisseron - Psychiatrist, member of the Academy of Technology, Founding President of "Institute for the study of relations between humans and robots" (IERHR), Rodolphe Hasselvander - Founder and CEO of Blue Frog Robotics, Jesse Arlen Smith - Founder of AI for Good, Founder of JohnnyFive AI, Pr. Luc Soler – Founder at Visible Patient, Francis Bach - Researcher at INRIA (hors cadre). Speakers : Moderator : Frédéric Vacher - Head of Innovation 3D EXPERIENCE Lab at Dassault Systèmes, Serge Tisseron - Psychiatrist, member of the Academy of Technology, Founding President of "Institute for the study of relations between humans and robots" (IERHR), Rodolphe Hasselvander - Founder and CEO of Blue Frog Robotics, Jesse Arlen Smith - Founder of AI for Good, Founder of JohnnyFive AI, Pr. Luc Soler – Founder at Visible Patient, Francis Bach - Researcher at INRIA. 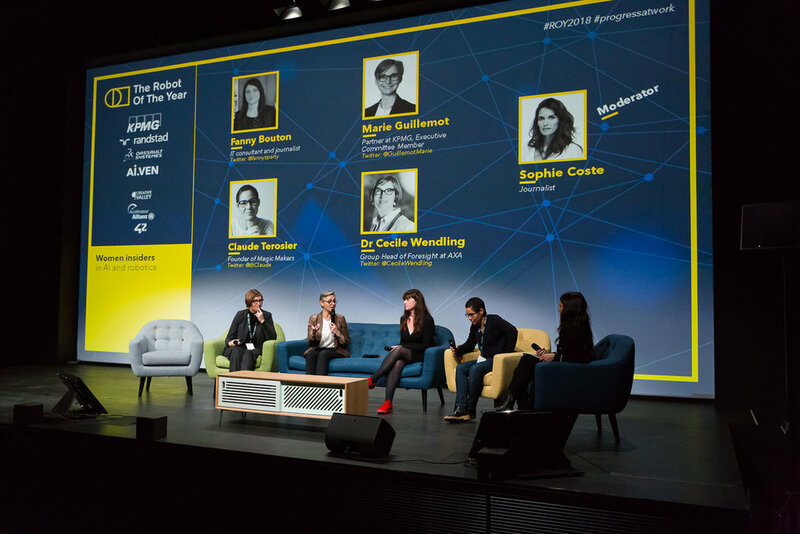 Speakers : Dr Cecile Wendling - Group Head of Foresight at AXA, Marie Guillemot - Partner at KPMG, Executive Committee Member, Fanny Bouton - IT consultant and journalist, Claude Terosier - Founder of Magic Makers, Moderator : Sophie Coste - Journalist. PANEL : READY FOR BUSINESS 4.0 ? Speakers : Bernard Ourghanlian - CSO & CTO, Microsoft France, Julie Caredda - Partner at KPMG, AI & Data Analytics, Pascal Thébé - Allianz France Executive Committee member, Head of Data, Client & Communication Unit, Luc Julia - Global VP Innovation & CTO Samsung (visioconférence en arrière plan), Moderator : Gregory Pouy - Digital Marketing Expert. Philippe Nacson - Founder The Robot Of The Year & founding partner Ai.VEN, Sophie Coste, journalist. Jean Louis Constanza - Co-Founder & Chief Business and Clinical Officer at Wandercraft, Christophe Aube - CEO AgreenCulture.